July 29, 2018. 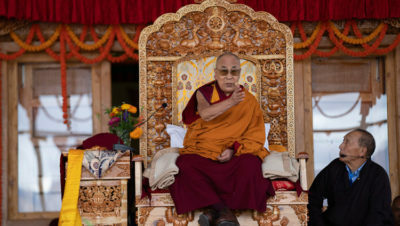 Leh, Ladakh, J&K, India – The morning was bright today as His Holiness the Dalai Lama travelled the short distance from the Shewatsel Phodrang, where he stays, to Thiksey Monastery. Shaded by poplar and willow trees the road wended its way between clusters of white-washed chörtens, past Shey Palace to Thiksey. He was welcomed on arrival by former Rajya Sabha Member, Thiksey Rinpoche and escorted to the teaching pavilion at the foot of the rocky outcrop on which Thiksey Monastery stands. He lit an auspicious inaugural lamp and paid his respects before a statue of the Buddha. His Holiness was then shown a model and plan of a Library and Learning Center, the ground-breaking of which Thiksey Rinpoche was asking him to bless, before he was requested to unveil the project’s foundation stone. After His Holiness had taken his seat facing the estimated 2500 strong crowd, Thiksey Rinpoche offered a mandala and representations of the body, speech and mind of enlightenment. In his introduction to the occasion Rinpoche paid his respects to His Holiness, other distinguished guests, students and others. He mentioned His Holiness’s commitments to promoting human values, inter-religious harmony, the preservation of Tibetan culture and protection of Tibet’s natural environment, as well as wish to revive ancient Indian knowledge. He declared them to be beneficial and relevant to today’s world. What’s more, he said, they represent goals to which even ordinary people can contribute. Thiksey Rinpoche called on the Ladakh Autonomous Hill Development Council (LAHDC) to support these projects. Geshe Shedrup Jhampa, leader of the All Ladakh Gonpa Association, noted the sanctity of the location of today’s gathering where not only had Lotsawa Rinchen Zangpo made prayers that monks should keep vows pure and the Dharma should flourish, but also Thiksey Monastery, the first monastery in the valley, was eventually established. It was founded by Jangsem Sherab Zangpo, a student of Je Tsongkhapa. Thiksey Rinpoche is his ninth reincarnation. He commended Thiksey Rinpoche for planning a centre of learning in this delightful setting, not far from Leh, where an introduction to Buddhism, training in logic and debate, as well as instruction in meditation would be provided. He called on everyone present to support Thiksey Rinpoche in this endeavour. Access to the centre will be open to all without discrimination, he said, mentioning approvingly Drikung Chetsang Rinpoche’s recent remarks opposing casteism. Ladakh Buddhist Association (LBA) President Tsewang Thinles thanked Thiksey Rinpoche for his initiative before announcing a new resolution on preserving communal harmony in Ladakh that was presented to His Holiness this morning. He said the LBA would make every effort to make it a lasting measure. The LBA intends to resist any attempts to disrupt communal harmony in Ladakh. He further announced that His Holiness told this morning’s delegation that he intends to come to Ladakh again next year. Dorje Motup, Chief Executive Councillor of the LAHDC greeted all present with a “Julay”. He expressed gratitude to His Holiness for the positive influence he has had in encouraging fellowship between Buddhists and other communities in Ladakh. Observing how beneficial the Library and Learning Center would be, he affirmed that LAHDC would give the project whatever support was required. Thubten Tsewang, MP for Ladakh, voiced his approval of the initiative to transform temples, monasteries and nunneries in the Himalayan region into centres of learning. He remarked that unless steps are taken to improve education, people remain ignorant, adding that creeping sectarianism must be reversed. MLA, Rigzin Jora told the audience how fortunate Ladakhis are in having His Holiness’s frequent presence among them. What’s more, due to Bakula Rinpoche’s intervention, many monks have been able to study in the great Tibetan monasteries re-established in South India. The result is a large increase in the number of scholars and qualified teachers who have returned to Ladakh. They have trained in the Nalanda Tradition that advocates the use of reason and scepticism over unquestioning faith. MLC, Tsering Dorje, observed that while many monasteries already possess libraries, inasmuch as they have collections of the Kangyur and Tengyur, the prospect of a modern library here at Thiksey is exciting. He urged the audience to use it when it is complete. 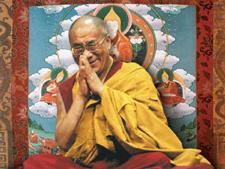 He ended with prayers that His Holiness live long and return to Ladakh again and again. Finally, His Holiness addressed the gathering. “We’re all here today because Thiksey Rinpoche has decided to create a Library and Learning Center. In the many years I’ve been coming to Ladakh I’ve seen a lot of progress in terms of new schools and an improved standard of living. Since the number of monks and nuns able to study in our centres of learning in South India has grown in recent years, the level of knowledge has also improved. “Material development will go on, but by itself it’s not sufficient to fulfil our needs. In highly developed societies in Europe, the USA and Japan, many people are neither happy nor at peace. Selfishness is unrewarding, whereas if you show concern for the needs of others, you’ll make them your friends. This is why all religious traditions encourage the development of love and compassion. “Recently, in Delhi, I met representatives of various Buddhist countries who had been meeting together and I asked them straight out – does spiritual practice remain relevant today? I pointed out that in many parts of the world, despite significant material development, people’s inability to find peace of mind leads them to turn to drink and drugs instead. In some places, like Japan, suicide is on the rise. “It’s having an unruly mind that makes people look down on, cheat and compete with each other. Thiksey Rinpoche plans to train people in secular ethics because we need warm-heartedness in our day to day lives. Love and compassion are good for our health; anger and hatred are not. Such an opportunity to study psychology and logic will be helpful and of widespread benefit. “Inter-religious harmony is something that contributes to communal peace. When I was in Zanskar I visited a Muslim school and spoke of the importance of resolving discord between Buddhists and Muslims. This morning, a delegation came to see me to present a resolution to preserve and defend harmony among different religions, as well as between different Buddhist traditions. To be successful will require overcoming narrow-mindedness, but I am very happy to have received this resolution. “Sometimes discord arises because of political meddling. In other cases it’s because out-dated thinking has become the accepted custom. An example is looking down on the so-called ‘lower castes’. This kind of discrimination must be set aside. Similarly, sectarianism is detrimental because spiritual traditions are intended to counter destructive emotions like anger and disdain not foster them. 13. ‘Treatise on the Sublime Continuum’ or the Uttaratantra Shastra. The Administrator of the Office of Thiksey Monastery offered words of thanks. From Thiksey it was a short drive to a small amphitheatre on the banks of the Sindhu River—commonly known as the Indus, which rises in Tibet—called Sindhu Ghat. He had been invited to lunch by the LAHDC, whose representative bid him welcome. Before lunch was served, Ladakhi artistes performed songs to the accompaniment of flute, drum, dramnyen and phiwang. His Holiness thanked the LAHDC for their invitation and expressed gratitude to everyone who has contributed to the success of his current visit to Ladakh. “Today, we’re joined by friends I met in my youth. Drikung Chetsang Rinpoche faced great hardship in Tibet after 1959, but in the end was able to come into exile. He joined his relations in the West, but eventually returned to India where he has worked hard to fulfil his responsibilities to his spiritual tradition. “Lama Lobsang, too, I’ve known since we first met in 1956. In those days he used to wear the robes of a Theravada monk. After a leisurely lunch with selected guests under a shamiana pitched right on the banks of the river, His Holiness returned to the Shewatsel Phodrang. As he announced, he will be teaching at the Shewatsel ground from ‘Guide to the Bodhisattva’s Way of Life’ for the next two days.